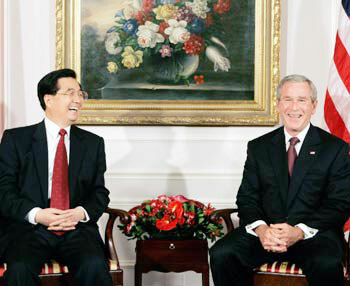 WHEELING, W.Va. - US President George W. Bush will meet with Chinese President Hu Jintao in Washington on April 20 to discuss issue of mutual interest and to make progress on resolving outstanding differences, White House spokesman Scott McClellan said on Wednesday. "The visit is an opportunity for the president to work with the Chinese leader on a number of areas of mutual interest and to make progress on resolving outstanding differences," McClellan told reporters traveling with Bush to West Virginia. One key issue point of contention is Washington's continuous demand for Beijing to move more quickly to let its yuan currency trade freely in financial markets. The spokesman said the discussions on Hu's first U.S. trip as Chinese president would include the full range of regional international issues, including Bush's war on terrorism and nonproliferation questions. Washington sees Beijing as a key partner in halting the nuclear arms ambitions of North Korea, and needs the help of China as a veto-wielding permanent member of the U.N. Security Council to rein in Iran's suspected pursuit of nuclear weapons. Hu's visit, rescheduled after a planned trip last September was postponed because of Hurricane Katrina, comes as some U.S. senators threaten China with sanctions unless it revalues the yuan. Sen. Charles Schumer, a New York Democrat, and Sen. Lindsey Graham, a South Carolina Republican, have introduced legislation that threatens China with a 27.5 percent tariff on its exports to the United States unless Beijing allows the yuan to strengthen significantly against the dollar. Many U.S. lawmakers and manufacturers believe the yuan is undervalued, giving China's exports an unfair advantage that has cost millions of American jobs and fueled a bilateral trade gap that hit a record $202 billion last year. Last July, China implemented a 2.1 percent revaluation and shifted to a managed float of its currency. Schumer and Graham, visiting China this week, have called for a greater commitment to floating the currency. The Bush administration opposes the Schumer-Graham bill, but it could go to a vote by March 31. Asked why the trip will not be billed as a state visit, Frederick Jones, a spokesman for the White House National Security Council, said, "Each visit to the White House is unique and follows different substantive and social formats." Hu is also expected to visit Seattle, and Yale University in New Haven, Connecticut -- stops on his canceled itinerary last year -- but officials there were unable to confirm the schedule.